In our last update, we covered the top considerations to keep in mind when you set out to choose your kitchen’s external hardware. Now that you know what type of hardware you want, we can get into a bit more detail on style. Key deciding factors when it comes to kitchen hardware styles are Look, Feel and Cost. Look is an obvious factor; you want it to be pleasant to look at and compliment the rest of your kitchen. Feel is very important, especially for active cooks, those with arthritic hands or trouble with their grip. A larger pull that you can use more of your hand on will reduce strain. Cost ranges widely, even within style, so don’t be afraid to look around. And if the perfect handles are still out of your reach, don’t worry! Just pick the type and size that you know you want, and it can be a easy upgrade later. For a closer look at the wide world of kitchen hardware options, we turn to Joni Hilton, an interior designer and contributing author at Houzz. Describing eleven kitchen cabinet handle types and the pros and cons of each; Joni’s full article is quite worth the read and can be found here at Houzz. There are a lot of choices available! Again, there’s nothing quite like looking at (and holding!) 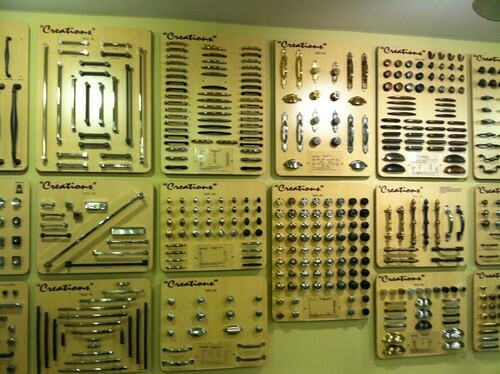 something in person, so try to get a sample or visit a showroom before deciding on your kitchen hardware. Not sure what your style is? To put a name to the look you like, you can check out our Kitchen Style Guides.